Smith machines are very popular and can be found in any gym whether big or small. There are a lot of people who really enjoy using the smith machine and there are those who will not get near them. I personally have been on both sides of this but I am one of those who won’t touch the thing now!!! 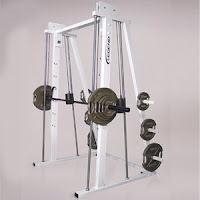 With that said, there are some good uses for the Smith machine; I believe the negatives more than offset the positives. So, what are the positives and negatives of the Smith machine…. I’ll start with the positives. The smith machine is definitely safer then free weights. You have the assistance without having to worry about stabilizing the weight during the up and down motion that the smith machine offers, additionally if you reach failure unexpectedly and can’t push anymore, you can turn your wrists and lock it in its place. With the Smith machine, you don’t have the danger of pushing yourself too far and not being able to lift the weight back up. Plus in many instances while performing movements on the Smith Machine you will not need a spotter such as when bench pressing with the Smith machine because you have the treat of locking it out! Another benefit of the Smith Machine its advocates like to point out is that usually, you can lift a bit more with the Smith machine since there is no wasted energy used to stabilized the weight. I’ll explain why this is actually a negative of the Smith Machine a bit later in the post…. What is weird about using the Smith Machine is this…..I use to only workout on a regular flat bench and due to ill conceived safety reasons switched the Smith Machine. What’s funny when I started performing bench presses on the Smith Machine I did less reps with the same amount of weight as I would do on a regular flat bench. So, forget about the stereotypes that aren’t always true regarding the Smith machine. I initially thought I would be stronger on the Smith machine but I was actually weaker. But over time I became more accustomed to the Smith Machine and my strength dramatically went up. However, when I switched back to the flat bench thinking that I would be able to lift the same amount weight as on the Smith machine I could not!!! What I noticed when I made this change I had lost strength in my stabilization muscles so while performing the bench press on a regular bench I was wasting energy on stabilizing the weight. The reason was that the up-and-down motion with the smith machine isn’t the natural motion for most lifters when they bench press. But it’s safe to say you can lift a little more with the smith machine since there is no need to use those stabilizing muscles when operating it. So let’s get to the negatives of using the Smith Machine. 1. When using the Smith machine you aren’t using your stabilizing muscles, which yes, make it safer–but you won’t get everything out of each particular exercise which will cut into you building muscle. There isn’t a need to balance the bar with the Smith Machine and that will lead to underdevelopment in your muscles or lack of development of stabilizing muscles. 2. Using the Smith Machine will make you more prone to injury since you are not working and strengthening your muscles responsible for stabilization. The Smith Machine will build muscle imbalances which will make you more likely to get injured when you’re doing any sort of physical activity. 3. It is a teacher of poor form for any exercise. There really is not many free weight exercises that use a 100% straight up and down movement, most have a slight arc or a slight bend so the straight up and down movement isn’t the correct form for the majority of exercises. Your body isn’t allowed to make any natural adjustments when performing an exercise and that can aggravate things. So you are probably thinking why is this so significant??? your joints, tendons and ligaments, that’s what!!! Let’s say for example that when you bench press with a traditional barbell the bar moves slightly back then forward as it travels up. When you perform the same bench press in the Smith machine, the weight moves straight up the guide rods, so the joints must stretch to accommodate the forces placed on the bar. Over time, great stress is placed on the wrist, elbow and shoulder joints. At the very least, you’ll end up with nagging pain as I did in the shoulders. I can validate that once I stopped using the Smith Machine 3 to 4 weeks later all my shoulder pain vanished!! Take squatting for example, an exercise that is commonly performed on the Smith machine. When most people squat on the Smith machine they plant their feet slightly in front of the torso, or directly in front of the bar, so the back is straight allowing free up and down movement….this is wrong! The proper form is feet positioned under you about shoulder width apart, with a slight arc in your back so then you can move up and down. One final thing to consider is you will not be able to build muscle and strength as fast as you would with free weights when compared to the Smith Machine. It all leads back to your stabilizing muscles and utilizing these to help balance the weight and perform the exercise. In fact, a study in the "Journal of Strength Conditioning Research Dec 2009" compared the free-weight squat with the Smith machine squat in six healthy individuals. Researchers used electromyography to measure muscle activation and found the free weight squat activated muscles at an average rate of 43 percent more than those performed on the Smith machine!!! With that said, if you’re looking to build muscle your best bet is to stay away from the Smith Machine. Undoubtedly, you will build muscle faster and become stronger faster. I personally don’t use the smith machine and don’t recommend it much. However, it can be helpful for those returning from an injury who would prefer to ease slowly into an old workout routine. Also, many people who work out alone like to use it since they don’t have a spotter. If it was me I would just be sure not to push myself to that point where I endanger myself without a spotter when using free weights. I don’t see much use for the Smith Machine other than the two reasons just mentioned. I’m sure some of you may disagree and when it comes right down to it.... it’s a personal matter. I just prefer to focus all my energy on getting the best possible workout from each and every set and rep I perform. This allows me to get stronger and build muscle mass the fastest so for me I’ll just stick to the free weights.